Inmarsat is a British satellite telecoms company, first privatised in 1999. In 2010 it won the MacRobert Award for its Broadband Global Area Network (BGAN) service. Inmarsat's latest I4 satellite system (as used for Inmarsat BGAN and Inmarsat FleetBroadband) uses 3 geostationary satellites to provide near global coverage. The previous generation I3 satellites ( Inmarsat Mini M, Inmarsat Fleet 33 Fleet 55 and Fleet 77 systems) used 4 satellites to cover approximately the same area. Coverage is near global for voice and data (i.e. Internet). Note: On the smaller terminals performance will be reduced or unavailable near the fringes of the coverage area. The advantage of the geostationary satellites is that your satellite phone antenna does not need a clear view of the whole sky, but only a narrow gap pointing directly at the satellite (possibly between two buildings or a gap in the tree canopy). 1) As the Earth curves away from the satellite towards the poles the satellite will appear lower and lower in the sky. This has the affect of increasing the footprint of a single spot beam, meaning that the signal is having to travel further and is less focused. Inmarsat's latest handheld satellite phone. 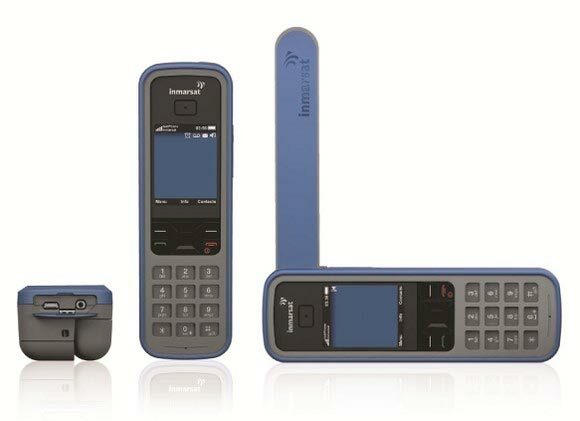 Find out more about the Inmarsat IsatPhone Pro. Each Inmarsat device has a different airtime pricing structure. The Inmarsat FleetBroadband is priced very reasonably, from as little as $52 per month! Calls cost from only $0.76/min. 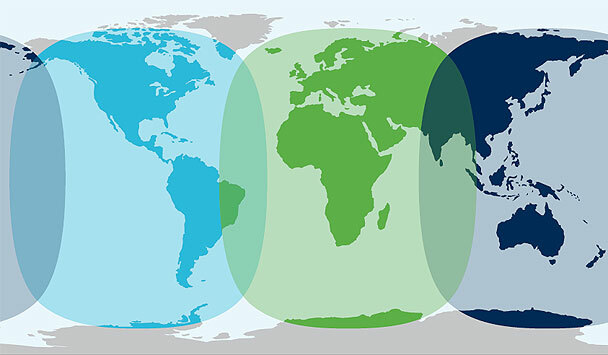 See our Inmarsat FleetBroadband Airtime page for more information on FleetBroadband airtime plans and rates. With our teleport-proxy and teleport-firewall, you can streamline your web browsing and slash your monthly bills! Contact us for information on airtime pricing for the IsatPhone Pro and BGAN units.